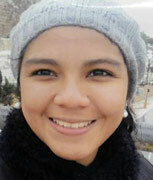 October 26, 2014 - Karen Jemima Mosquera, 22, of Ecuador, critically injured in the terror attack on a Jerusalem light rail station on October 22, died of her wounds on Sunday, October 26. Karen Jemima Mosquera had come to Israel a year and a half ago from her home in Guayaquil, Ecuador to complete her conversion to Judaism after discovering she was descended from Conversos, Spanish Jews forcibly converted to Catholicism after 1492. She spent the last two months in a Midrasha, an institute of Jewish studies for women, with other women from South America. Prior to moving to Israel, she had studied Family Psychology at the Catholic University of Guayaquil and was planning study archeology in Jerusalem. While on her way to a Torah lesson, she embarked from the light rail at the Ammunition Hill station and was critically wounded when a Palestinian deliberately rammed his car into the pedestrians at the station. She succumbed to her wounds at the Hadassah Medical Center in Jerusalem's Ein Kerem. Her mother and her sister had been flown in from Ecuador to be by her side. Her father Guido arrived to attend her funeral. "She was a quiet girl who believed in her path, fought to become a Jew and nothing bothered her," said a friend. Her mother said that her daughter’s dream had been to come to Israel and build her life here, but her life was cut short. At the family's request, in fulfillment of Karen's wishes, Karen Jemima Mosquera was laid to rest on the Mt. of Olives in Jerusalem. She is survived by her parents Guido and Cecilia Barrera, and sister Priscilla.